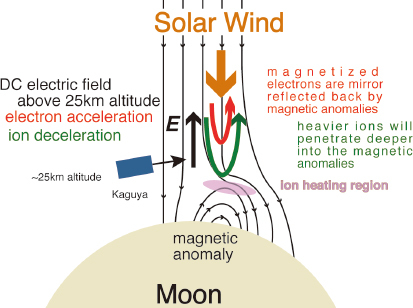 To understand the interaction between solar wind and lunar magnetic anomalies, low energy electrons and ions over lunar magnetic anomalies were simultaneously observed for the first time by the "Kaguya" satellite. This paper discusses the plasma structure over the mini-magnetosphere. The observations clearly showed acceleration of electrons and deceleration of ions and suggested the existence of a non-adiabatic dissipative interaction between solar wind ions and lunar magnetic anomalies. Since the interaction between solar wind and lunar magnetic anomalies occurs on the smallest scale of its kind, it contributes to the understanding of the interaction between solar wind and magnetized airless bodies in space. This is one of the most significant achievements of the Japanese spacecraft mission "Kaguya". These observations have been cited by many studies dealing with solar wind-lunar magnetic anomalies interactions. This award-winning article was a contribution to the special issue of "Comparative Studies of the Plasma at Non-magnetized Planets/Moons."